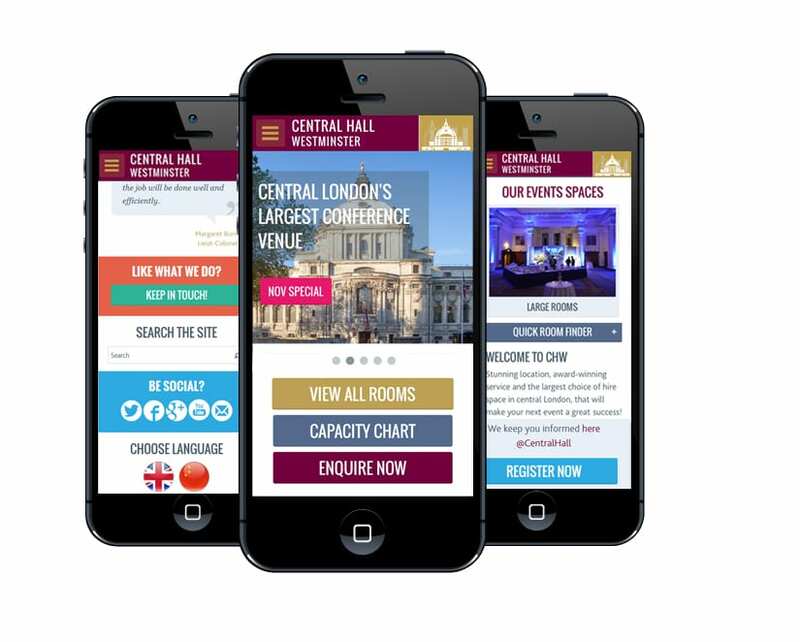 Central Hall Westminster (CHW), central London’s largest purpose built conference centre, today announced the launch of a specialist business event website built for mobile devices. The new mobile site has been created in response to a 70% rise in traffic from mobile devices to the CHW website. The site is available in both English and Mandarin to maximise CHW’s growing customer base in the People’s Republic of China. CHW has previously recognised the importance of Chinese business tourism by producing a multi-lingual desktop site and appointing a dedicated account manager for the Chinese market. This commitment was recognised in April 2013 when CHW was awarded the Chinese Tourists Welcoming Award for ‘Best Internet/ Media Campaign by overseas business’. The new designs were implemented by web design and development agency Applejack, a long-standing partner of CHW. The site includes mobile-specific elements, such as image and content sliders, carousels and virtual tours, all utilising swipe and drag navigation for touch screens. Additionally the text size has been increased and the font changed in places to improve legibility. Easily accessed menus and large buttons aid navigation, providing the user with an optimal viewing experience on multiple mobile platforms.